1. Cornwall is unique, one of the world’s most wonderful destinations, known for its wild and rugged coast to the North and sheltered bays in the South, its wildlife, ancient heritage, tradition and natural landscape. We are also thought of as the ‘Garden Capital of the World’. 2. Eighty percent of Cornwall is surrounded by water that gives us the longest stretch of coastline in the UK. We have over three hundred beaches with clear waters and at any point in Cornwall you are never more than sixteen miles from the sea. 3. We have the magical Isles of Scilly, consisting of five inhabited islands and many small islets. They are home to a large variety of rare plants, flowers and bird life not seen on the mainland. The nature sanctuary known as Looe Island which lies one mile off the South Coast, known for its outstanding natural beauty and has an area of 22.5 acres. Its highest point is 150 feet above sea level and has magnificent sea views. Walk along the causeway and visit St. Michael’s Mount at Marazion. 4. Cornwall has been the backdrop for many film and TV productions going back as far as 1935 with the production in Falmouth of ‘The Mystery of the Marie Celeste’ to 'Summer in February' filmed at West Cornwall and Holywell Bay in 2012. Britain's first-ever surfer was filmed at Holywell Bay surfing on a home-made board in 1929. February 2013 seen the filming of 'The Fold' in West Cornwall, more Rosamund Pilcher films were made here in Cornwall in the Autumn of 2013 and in July of 2013 film director Mike Leigh had been filming at Kingsand about the 19th century British Romantic Landscape Artist J.M.W. Turner. 'About Time', written and directed by Richard Curtis, part of which was filmed in the St. Austell area, was released at the beginning of September 2013. In October 2013 a re-make of Jamaica Inn, made famous by Daphne DuMaurier, was filmed at Holywell Bay on the North Cornwall coast and on Bodmin Moor. In September of 2015 an Agatha Christie novel was filmed at Holywell Bay. In the Spring of 2015 we watched the last episode of the first series of Poldark which was filmed in Cornwall during 2014 but the good news is that the second series is now being filmed here in Cornwall ready for release in 2016. This was aired on September 4th, 2016. In February 2017 series 3 filming was underway and was aired later on that year. 2018 seen the final series filmed, sadly we will not see Ross and Demelza at Holywell Bay and along the Cornish coast filming any more scenes. 5. We have superb Holiday Cottages and Holiday Homes. Our historical houses, sub-tropical gardens, wildlife and visitor attractions offer you adventures to keep you busy far longer than your summer holidays. 6. Cornwall receives many awards each year with the South West Tourism Awards, British Travel Awards, Food Magazine Reader's Awards, Cornwall Tourism Awards, Country File Reader's Awards just to name a few. 7. We are still the home of yeast cake and saffron buns, locally caught fresh fish, pasties and Cornish cream teas - cream made by Roddas which is from our Cornish cows milk. The jam must go on first though! You will be spoilt for choice. Cornwall enjoys the power of the Gulf Stream with its temperate climate of warm summers, mild and wet winters which in turn allows exotic and rare plants to thrive. Cornwall is often thought of throughout the world as the 'Garden Capital of the World'. Where else can you find so many gardens with history dating back to the Iron Age? As long ago as the early 19th century Cornish gardeners were part of the Victorian plant hunters who collected exotic plants and seeds from all around the world. All around Britain you will be hard-pressed not to find a 'Veitch' plant or one derived from their nurseries which were based in Chelsea and Exeter. The Chelsea business ceased to trade in 1914 whilst the Exeter branch continued under family members until 1969 when it was sold to St. Bridget Nurseries. The Veitch family sent many collectors all over the world to bring back seeds and plants. These included two Cornish brothers, William and Thomas Lobb, William Lobb died in San Francisco in 1864 but his brother Thomas lived in Devoran on the South coast of Cornwall until his death in 1894. In 1897 Ernest Henry 'Chinese' Wilson was sent out to China by the Veitch family to find the dove tree, Davidia involucrata and was told 'don't spend time and money wandering about. Probably every worthwhile plant in China has now been introduced to Europe'!!! George Forrest was sent to China in 1905 by Arthur Kilpin Bulley, who was sponsoring an expedition to the southwest searching for exotic plants, particularly species of rhododendron. Eventually George Forrest became one of the foremost collectors of Yunnan (Chinese) flora amassing hundreds of species of rhododendrons, shrubs and perennials. That gives us what we have today: tranquil and spectacular gardens to explore with lush vegetation and sup-tropical theatres of colour brimming with exciting, rare and beautiful plants. Cornwall's gardens are found in our magnificent Castles, Manor Houses, grand Farm Estates, Mill Houses, private houses, sheltered valleys, high up on blustery moorland and nestled in woodland and seaside gardens. Cornwall's gardens are so diverse as they vary in size from small and intimate to acres of rolling countryside. Some with enchanting lakes and a Victorian boathouse to water gardens with tree ferns, rhododendrons, camellias and magnolias. Others have walled gardens and manicured lawns to the newest of all two magnificent Biomes filled with magic from around the world namely The Eden Project, Nr. St. Austell. A lot of our gardens are Dog Friendly. so don't leave part of the family at home, bring them along as well. It would be wise to check first with the garden you are intending to visit just to make sure that it is 'dog friendly'. Some of our Cornish gardens are more accessible than others so again if part of your group is less agile check with the garden to make sure you will enjoy your visit. When 50 blooms have appeared on all seven of Cornwall's champion Magnolia campbellii trees it is said that Spring has officially arrived in Cornwall. The gardens that are being closely watched are Caerhays Castle Gardens at Gorran, Nr. St. Austell, The Lost Gardens of Heligan at Pentewan, St. Austell, Trebah Garden at Mawnan Smith, Nr. Falmouth, Tregothnan at St. Michael Penkivel, Truro, Trengwainton at Madron, Nr. Penzance, Trewidden at Buryas Bridge, Penzance and Trewithen at Grampound, Nr. Truro. In 2013 Spring had officially arrived in Cornwall on February 19th, a whole month before the official start of spring in England. In 2014 we were a little later and the date was March 3rd. 2015 was March 3rd as well. 2016 was February 10th and 2017 it was February 28th. 2018 - Even with the 'Beast from the East' it was February 26th. Cornwall has won the heart of the nation and held onto its crown as the Best UK Holiday Destination in the British Travel Awards 2014 for the sixth consecutive year. Having first secured the title in 2009, Cornwall has successfully shunned competition from rival destinations around the country, including Northumberland and Devon who took silver and bronze respectively, to win the public vote and cement its position as the premier visitor destination. Malcolm Bell, head of Visit Cornwall, who was at the award ceremony in London to collect the trophy on behalf of Cornwall, said 'The love for Cornwall shows no sign of abating. As well as boasting a very loyal and passionate visitor base, Cornwall is well-known for turning first-time visitors into lifelong fans. Holding the title for six years is real cause for celebration for everyone involved in the industry, it represents value in our product and strength in the Cornwall brand'. The award comes six months after world-renowned travel guide publisher Lonely Planet listed the South West among the top three places to visit in Europe - ahead of some of the grandest locations on the European Grand Tour. Lonely Planet included the region in its latest list of the top ten must-see locations and its travel experts rated the region's rich moorland, rugged coastline and miles of sandy beaches as being on a par with heavyweight holiday spots Greece and Italy. The ranking placed Devon and Cornwall firmly on the radar of millions of travellers and cemented the region's position among the global elite of dream destinations. A TRUE STORY ABOUT A VERY LARGE LOBSTER! It was a rainy day here in Cornwall and two local builders named Derek and Paul from West Cornwall could not continue with their current job so they decided to visit the Seafood Festival in Penzance to get something to eat. On their way they saw a large lobster sitting on ice in a shop, took pity on it and without thinking what they were going to do with it, paid £30 to save it from the pot. He was obviously old because he was huge, lobsters are long-lived crustaceans and some reach ages of 50 years or more. They telephoned the Blue Reef Aquarium at Newquay who agreed to take him but he must be kept cool and in seawater. Derek and Paul's next stop was at a local B & Q DIY store where the Manager donated a large plastic container and then they set-off down the beach to collect the seawater. They then headed for the Blue Reef Aquarium where 'Rocky' as they had now named him, was put in a quarantine tank for the required amount of time to ensure he was fit and healthy. All was well, Rocky was fighting fit and has now been put into the main native marine display. To see Rocky just visit the Blue Reef Aquarium at Newquay or go to their website www.bluereefaquarium.co.uk and find the story and pictures under News. An extremely lucky day indeed for Rocky that it was raining here in Cornwall! Looe or (St. George’s Island) lies less than one mile off the South Coast of Cornwall, Near Looe and consists of 9 hectares (22 acres) of coastal grassland, woodland, rocky reef, sand & shingle beaches and is one mile in circumference. This unique island was home to the Atkins sisters who bequeathed it to Cornwall Wildlife Trust. Babs and Evelyn Atkins purchased the island in 1965 and at that time Evelyn was a teacher in Looe and she stayed on the mainland during the week leaving Babs alone and the only methods of communications at that time were flag and hand –signals! Evelyn wrote 2 books about their acquisition and what living was like on this island paradise. ‘We bought an Island’ in 1976 and ‘Tales from our Cornish Island’ in 1986. Evelyn died in 1997 aged 87 and Babs continued to live there alone until her death in 2004. Now, in 2014, Cornwall Wildlife Trust are celebrating 10 years of owning Looe Island and have, together with many volunteers, worked tirelessly to enable this Nature Reserve to reap the rewards and create a haven for wildlife. Looe Island is home to a wealth of wildlife and records show at least 60 different birds here each year, 17 species of butterflies, 50 different seals, many breeding pairs of great black-headed gulls, herring gulls (seagulls), cormorants, shags, oystercatchers and last and by no means least the flock of 20 Hebridan sheep. The sheep, with their black fleeces, keep the vegetation down along the coast which in turn has helped the ground nesting sea birds and the rat population is now eliminated. A range of crops are grown in the gardens and lots of their dessert, eating and cider apples get juiced and sold which in turn has helped fund some necessary work. Another unique thing is the woodland trees - it is unusual to have a wooded island - so the Trust are adding different varieties of trees to the sycamores already growing here. Unusually, the islands foreshore is not owned by the Crown but is private property. In 1873 the then Prince of Wales (later Edward VII) sold the rights to settle a gambling debt! At the highest point, which is 150 feet above sea level, is the remains of a Benedictine chapel, called St. Michael’s, built-in 1139. In 2008 Channel 4’s ‘Time Team’ were given permission to visit the island and excavate around St. Michael’s Chapel which exposed a plan of the building. Lots of Roman Coins were found as well as the remains of an adult male and a piece of pottery believed to date back to the 13th century. You are probably wondering by now how you can visit this fascinating place? Well, between April to the end of September you can hop on to The Moonraker boat at Buller’s Quay in East Looe, travel the 15 minute journey and be met by Jon Ross the island’s warden and his assistant Claire Lewis. They will take you on a guided walk and will help you spot the grey seals, the gulls and explain the history and plans for the future. They may well explain how they manage without any mains water, electricity and no shops! It will be interesting to hear what life was like here when Cornwall experienced the relentless storms during the winter of 2013/2014. At the end of the guided tour there is an optional slide show inside Jetty Cottage or you may wish to explore the island a bit more, perhaps visit the hide which overlooks the cliffs. The visit should last about 3 to 3.5 hours but is always governed by the tides and weather. If you visit during the spring the reward will be the daffodils in flower, the trees springing into life, the birds preparing to nest, the smell of the wild garlic, the sea campions and maybe some new-born lambs bouncing around and playing in the sunshine. The summer brings the feeding of the young birds and taking their first flights, the vast array of insects going about their daily lives, the butterflies and moths on the butterfly bush, the buddleja - which will be in full bloom, the yellow bird’s foot trefoil spreading through the grass which flowers from May to August, Valerian in the gardens with their scented pink heads, the wildflower meadows and the rugged coastal plants named sea pinks or thrift with their round globes of pink flowers. The wardens will show you their organic fruit and vegetable plots with grapes, globe artichokes, radish and raspberries to name just a few. You may like to stay in the Tipi on a three-night short break and experience how peaceful island-life is. Only a few dates are available each year so forward planning is definitely required. Another unique opportunity is to have exclusive use of the island for your wedding or maybe a blessing or renewal of vows. In the future Smugglers Cottage may become a holiday let which will be a great way of injecting funds to look after the islands wildlife and visitors. Plans are also afoot to improve the Visitor Centre so that it gives more information, not only about the history of the island, but about the diverse wildlife that has made Looe Island their home. Visit the Cornwall Wildlife Trust website to book your visit but please remember that these visits are very popular so early booking is essential. Enjoy your time on a ‘very special Cornish Island and Nature Reserve’. For many years my family and I have walked the Gannel Estuary and many times mentioned the old boat carcass aground on the sands together with the Egrets going about their daily business. I often wondered about this boat, the Ada coming to mind, but not knowing any more continued on with our daily lives. Then settling down one Sunday evening watching television, Kevin McCloud comes on with his new series of 'Kevin McCloud's Man-Made Home', barely watching it between the iPad and dozing I noticed he was at the Gannel Estuary taking bits off the 'old boat'. Hey! I said 'what does he think he is doing, how can he do this'? My interest had now been awoken so with a bit of research I found out the history of the 'old boat'. Her name was 'Sanu' a 62 ft MFV ex Navy Supply tender built-in 1942 for the Admiralty in Looe by Curtis & Pape Ltd., and was one of 50 boats ordered by the Royal Navy. In 1964 the respected writer Denys Val Baker purchased her from Southampton, with a legacy from his late Mother, for 4,500 pounds. The Sanu was then safely moored up a creek at Golant, Fowey which is why he bought a property called 'Sawmills' which could only be accessed either by boat or the China Clay Railway. He could moor the boat and get inspiration for his books, short stories, many articles and autobiographies and write in his studio in the sun. Denys and his family spent many Summers on Sanu, sailing to the Channel Islands, The Isles of Scilly, up the Seine to Paris, to Brittany, Scotland & Loch Ness, Scandinavia and finally across the Bay of Biscay to the Mediterranean where she lived for many years. She was a great inspiration to him and featured in 'The Timeless Land', written in 1973, 'A View from Land's End' in 1980, 'The Petrified Mariner' in 1972 and 'To Sea with Sanu' in 1967. Sadly Denys Val Baker died in 1984 at Penzance. Her last voyage in April 2002 was to sail along the North Cornwall Coast bound for dry dock in Bristol for a major and much-needed restoration. Unfortunately, she suffered engine failure during this journey and took refuge in the Gannel Estuary. Lack of engine power and high spring tides washed her up the Estuary to her final resting place. Since 2002 any attempts at restoration proved impossible and the National Trust made many attempts to find her owners but to no avail. 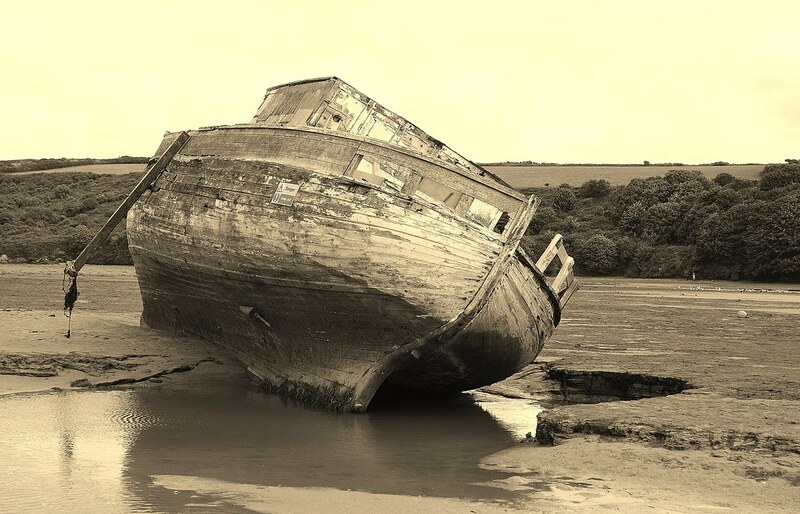 In 2011 the aim was that a buyer would be found for Sanu - a new owner would restore her to her earlier beauty and on a high tide take her out of the Gannel Estuary - but this proved fruitless. The National Trust had feared that the hull had deteriorated so much that she would break up and cause a hazard so this historical boat with so much character and which had drawn hundreds of tourists and photographers over the years, would be broken up and removed. So with no purchaser found and the National Trust being contacted by Kevin McCloud in June 2013 who was building his dream beach home 100 ft up a cliff near Minehead in Somerset, which was a recycled cliff-top cabin, they agreed that he could remove some of the timber for his wooden veranda and for other parts of his 'man-made home'. In October 2013 the National Trust decided to dismantle her at which time they filmed it and MAST (Maritime Archaeology Sea Trust) took a complete mid-section frame and stem section, where it meets the keel, so it could be studied and compared to the plans for this type of ship, by Bournemouth University. The Sanu represents the last major phase of wooden boat construction in the United Kingdom. It took just 6 hours to remove all trace of the Sanu 'Now you see her ...... now you don't'. 'Here one minute ...... gone the next'. A sad ending for an iconic boat on the Gannel Estuary at Newquay. The Cornish Chough, the national bird of Cornwall, is a member of the crow family but smaller than a carrion crow and has a blue/green sheen to its plumage, a red bill and red legs. It is a graceful bird with a high-pitched call and was earlier named Palores which means Digger as it digs at loose soil looking for invertebrates. Its association with Cornwall is on the counties coat of arms, sitting on top of the crest with a tin miner and fisherman on either side. Legend says the soul of King Arthur departed in the form of a chough because its red bill and legs related to Arthur’s bloody and violent death. By the end of the 18th century the number of choughs had started to fall because of hunters who wanted a ‘Cornish Souvenir’ but also because its habitat was rapidly changing. In the days of the Industrial Revolution, when manufacturing processes changed and the Cornish Tin Mines were dwindling, the ponies, cattle and sheep which grazed the cliffs were moved inland so the coast became overgrown with gorse and bracken making hunting for crane fly larvae, dung beetles and ants very difficult. The rabbit population also decreased dramatically due to Myxomatosis which also added to the over-grown coastal fringes. In the 20th century pesticides came into the farmers lives reducing the chough population even further and by the early 1900’s nesting had stopped completely on the Lizard peninsula. The pair that had lived near Newquay on the North Coast one was found dead in 1967 and it’s mate also disappeared in the following months. During the next 28 years a pair of choughs arrived in Plymouth during 1986 and 1987 but they also disappeared. Then in 2001 a small group appeared on The Lizard, possibly from Ireland, and hey presto in 2002 a pair nested and three chicks fledged. So for the first time in over 50 years choughs had made Cornwall their home once again. They have bred on The Lizard for the past 11 years and raised 44 young. Records show that from 2001 to 2013 somewhere between 96 and 118 chicks had fledged. These graceful birds can now be seen from Godrevy to Mawgan Porth as well as on The Lizard peninsula and in the far west of Cornwall. Pete Cross writes in the February 2014 issue of Cornwall Today about the two on The Lizard that moved into a secret cave in 2001. He named them Dirak and Bir and it was them we wrote about earlier that raised 44 chicks. Sadly Dirak died in a horrendous and violent fight in June 2013, Bir stayed for a few days but then disappeared – choughs pair for life so she possibly pined away. Thankfully their offspring are continuing to increase the chough population in Cornwall. Paradise Park, home of Operation Chough, bred some young choughs, which were then taken to the Durrell Wildlife Conservation Trust in Jersey, the chough had not been seen there for about 100 years. After a few months of them getting used to their new surroundings the Centre opened the hatches for a small amount of time each day. Some stayed in their aviary while others flew out and then returned, the remainder came back after a few days. There is a continuing programme to restore the habitat on the Coastline so the chough will have a good home in Jersey as well. As for Cornwall, let’s hope that this delightful bird will continue to live and breed here and show us all their wonderful displays of diving and swooping for many years to come. In the Spring of 2014 17 youngsters have fledged and reports say that a chough from Brittany has been recorded here in Cornwall this Spring. Cornwall is full of myths and legends and none more so than the legend of St. Piran’s Oratory, Nr. Perranporth. The secrets of the Oratory have long been buried but this is where the Patron Saint of Cornish Tin Miners and Cornwall ‘St. Piran’ came ashore on a millstone from Ireland in the 5th, 6th or even 7th century. Nothing had been written so we can only imagine what happened. St. Piran, as the story goes, built a chapel out of wattle and sand but this was not strong enough so a new one was built of stone and is now possibly the oldest Christian building in Britain. The Oratory is a rich icon in the history of Cornwall and the legend says that he made a fire in the building and with the white metal that flowed from it he forged a white cross in tin which has become the symbol of Cornwall. It is these remains that we now know today as St. Piran's Oratory or the Lost Church which has become a pilgrimage on St. Piran's Day March 5th and many people march to the remains on the Sunday nearest to this date each year. There are also many other events held throughout Cornwall on March 5th to commemorate him. The building was always under threat of being covered by sand so a new Church was built within a short walk from this one across a nearby stream. Large quantities of sand were removed from the Oratory in 1835 and again in 1843 when railings were put up to surround the church to protect the delicate walls. Over time more sand built up and caused pressure on the walls so after raising money in 1910 a concrete structure was put in place to surround it. An important grave yard was also buried by sand and over the years archaeological remains have been found close to the surface of the site and rows of skeletons were seen in 1820, 1835 and 1905. In 1910 a woman’s skeleton holding a child was found near the door of the Oratory. In 1980 with flooding and vandalism in mind the Oratory was buried with sand by a mechanical digger and at this time 12 cist graves, some with slate tops, became exposed 10 to 13 metres from the entrance. After many attempts over the past 15 years permission has now been obtained by the St. Piran’s Trust to uncover this medieval site so that archaeologists can see exactly what, if any, damage has been done by covering it in sand. A decision will be made with regard to re-covering it or to go down another route, so here we are in February 2014 and the dig to uncover St. Piran's Oratory has begun. On the 7th February, 2015 approximately 150 people gathered at The Oratory for a special Songs of Praise recording which was being filmed by the BBC. The service was attended by the Grand Bard of Cornwall and The Right Reverend Chris Goldsmith, Bishop of St. Germans. It will be shown on the television on 22nd March, 2015. For well over 100 years the Port of Truro Oyster Fishery has been oyster dredging in the Fal estuary from Oct 1st to the end of March each year with the men enduring the freezing cold sea and biting winds. The Fal river oyster beds are the last ones in Britain, and the largest oyster fishery in Europe, where only the traditional harvesting methods are used which means that they are only worked under sail, oar or haul-towed punts owing to the law which dates back to 1868 which makes it illegal to gather oysters with any mechanical means whatsoever. This method ensures that they are not over fished and helps to conserve them. There are about 12 sailing boats which work the Fal estuary out of Mylor, many of them being from families where being a oysterman is a family tradition. Each boat will have a licence to dredge which costs £160 per dredge and oysters can only be fished which measures 5cms or larger - checked with an oyster ring - and any that fall through this ring are too small and are returned to the river bed to grow bigger. The dredges are towed across the seabed and hauled on board with a hand-winch. An inspection can happen at any time by the oyster bailiff. Oyster fishermen need many skills- such as how to sail, knowing the beds, the tides, wind and how to dredge, not to mention the ability to drift in the necessary direction at the correct speed. Once the oysters are ashore they are then purified for 36 hours before being sold on to local shops as well as taken up the country and to some of the top chefs in London and abroad. November 5th is always a holiday for the fisherman which goes back to 1901 when the Truro Oyster Fishery won a High Court victory to leave their catch in bags on the foreshore before being sent to market. In 1978 the Silver Oyster Race began which takes place on this date each year and organized by Mylor Yacht Club. New legislation is coming in when the Cornwall Inshore Fisheries & Conservation takes over the fishery. In November 2013 the unique Fal Oyster received 'Protected Designation of Origin' status with the European Union. Let us hope this tremendous tradition carries on for many more years but it relies on younger people coming into it, learning the skills and dedicating themselves to carry it on. 18 years ago the Council wanted to bring visitors to Falmouth outside of the summer season and before the Christmas festivities began. So the Falmouth Oyster Festival was born and is now held in Events Square every October. Events include the Oyster Parade through the town, cookery demos by some of Cornwall’s top chefs, craft & food stalls, shucking competitions and live music. The Falmouth Working Boat fleet used by the oyster fishermen race during the summer in the Carrick Roads and at various regattas up and down the country. These boats will be racing in the working boat race in the inner harbour on the final day of the festival. Local school children also march through the town to Events Square. But of course the star of the show is the humble oyster when several thousand will be swallowed during the festival weekend. This year on March 28th to the 30th there was an Oyster Gathering & Seafood Harvest - a small oyster festival held on Flushing Quay where you could join the oyster men on their last weekend of the season. Locally harvested seafood cooked by local and international chefs was on offer and also a seafood market. There were also boat trips available out on the Fal estuary. After parking the car and reading the directions to St. Nectan’s Glen we crossed the busy road setting out for our afternoon walk. As we passed St. Piran’s well and St. Piran’s Chapel at Trethevy, about one mile east of Tintagel, we promised ourselves we would take a look inside on our return. Up hill and down dale we walked along the beautiful and sparkling Trevillet River with its ivy and moss clad trees, now an Area of Outstanding Natural Beauty, listening to the bird song and seeing the sun glinting through the huge trees heavily laden with leaves. Passing a pretty wooden bridge with a signpost tempting us to go another way we kept on our course to the waterfall. We soon arrived at the Hermitage and were met by the Owner, a friendly gentleman, who tempted us with a Cornish cream tea but we decided first to learn about the history of this fascinating place, visit the waterfall and then come back up and enjoy it over a pot of tea. Visiting the hermitage and waterfall today you follow the same path used from the 6th century by the pilgrims who came to pray at the Shrine of Saint Nectan who settled here and built his home above the waterfall beside the Trevillitt River in about 500 AD. Legend says that the silver bell which hung in the tower behind the chapel was dropped into the kieve (Cornish for ‘basin’) because of the feud between the Celtic & Roman faiths and St. Nectan vowed that his bell should never ring for non-believers. His belief was in the older, simple faith of the Celts. If the bell tolls now, which it is said to happen from time to time, then this is a bad omen! On his death two women, possibly his sisters, (his father, St. Brechan sired 24 children) lived in the Chapel at St. Nectans Glen and it was his wish that his body was placed in an oak chest, together with some of his treasures, and buried in a grave in the riverbed below the Kieve, the river flowing over his grave. The sisters were known locally as devils and they lived like hermits and on their death the local people buried them together under a flat stone in the valley close to the fall. Maybe this is where the superstition of the two ‘gray ladies’ who haunt Genver Lane comes from. Many years passed and in 1860 a cottage with two rooms were built on the site of the Chapel. The walls, which are 3 feet thick, were retained and the rest of the building was made of wood. Additions were made in 1900 and the present kitchen floor is probably the remains of the Tower. Over the years legend has it that the hermitage & kieve are linked with King Arthur and his knights, he may well have stopped at St. Nectan’s Shrine climbing the steps that were cut out of solid rock which you will use today. Having learnt the history of this magical place we passed through a gate and descended the very wet steps holding on tight as we rounded the corner and heard the thundering water that was coming down the fall and oh! My goodness what a fabulous view came into sight. The waterfall itself is about 60 feet from top to bottom and the kieve is 20 feet deep and rounded like a large bowl and over time the front of it has broken away with the force of the water falling into it. There are the remains of three former basins above this one all broken away in the front. In the picture of ‘Girl at the Waterfall’ now on view at the Victoria & Albert Museum the landscape can be recognized as the beautiful waterfall at St. Nectan’s Glen. Now for that Cornish cream tea and a chat about our fabulous experience before we head on back through the valley and pop in to St. Piran’s Chapel to round off the day. In October 2012 the former BBC presenter Robin Page suggested that Tresco, one of the Isles of Scilly, was an ideal place to colonize the declining red squirrel and Prince Charles, who owns the Duchy of Cornwall which includes the Isles of Scilly, supported it. 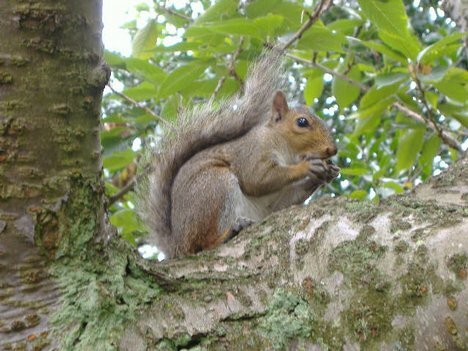 Tresco is an island where there are no invasive grey squirrels - who are aggressive by nature and carry the Squirrel Pox virus which can kill our reds within two weeks – the greys are immune to this pox. The law protects the red squirrel but they are still hunted for their fur and because of their colour are also caught by predators. There are three million greys compared to 120,000 reds. The reds have been in the UK since the Ice Age but have not been seen in Cornwall since 1984. Greys will eat anything and do so much damage to young trees but reds are specialist feeders. Their food consists mainly of tree seeds but they can eat the buds, flowers and shoots of deciduous and conifer trees. Other foods include fruits, berries, caterpillars and fungi. 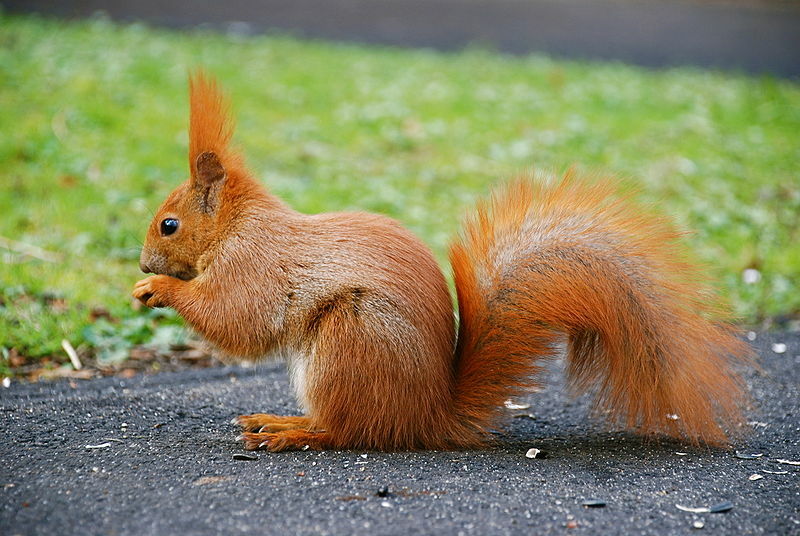 Reds cannot eat acorns as they have a high tannin content. It was also the dream of Humfrey Wakefield, an extremely clever and humorous potter on the Isles of Scilly. He loved all forms of nature and thought that the islands were the perfect habitat for the red squirrel but he died in 2010 before he could see the idea come to fruition. During the Winter of October 2012 five red squirrels were kept in enclosures in the Tresco Abbey Gardens but only two survived. In October 2013, when the weather was still warm and calm, 20 more left the British Wildlife Centre in Surrey. They were individually boxed and travelled by road to RNAS Culdrose, Nr. Helston and the plan was that a Sea King Helicopter would fly them to Tresco on one of their routine training flights. Unfortunately, the expected calm Autumn weather changed and as soon as the red squirrels arrived at the Royal Naval Air Station the weather in Cornwall deteriorated with poor visibility, gales and rain. Consequently, the Royal Navy could not fly, but after a couple of worrying days the weather improved and 18 survived the journey. 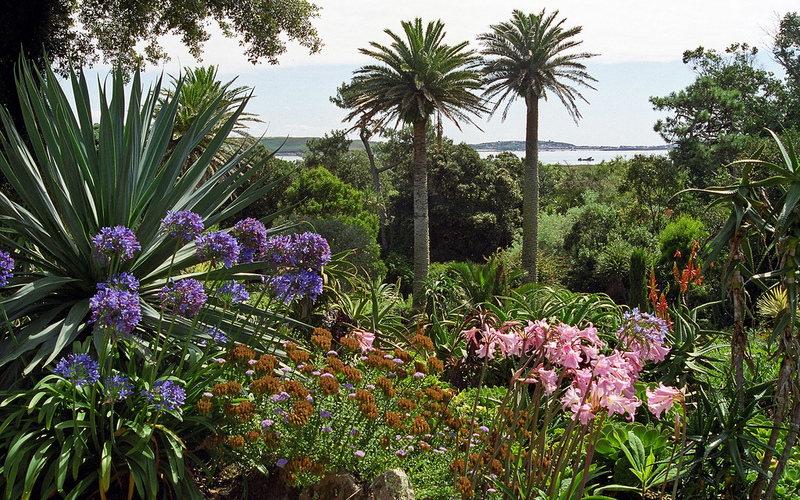 The opening of the boxes took place two days after they arrived, gradually they emerged and started exploring the beautiful Tresco Abbey Gardens. Hopefully in the Spring of 2014 some kittens will have been born (yes, kittens are the young of squirrels) and the number of our red squirrels will increase once more. In Cornwall there is a Red Squirrel Project which involves recolonizing the red squirrel but there cannot be any threat from the grey. Eradication of the grey squirrel is the answer but until then we can only presume that Cornwall will not see red squirrels in the wild. In 2012 at Trewithen Gardens, Grampound Road, Nr. Truro they took delivery of two female red squirrels and Prince Charles released a male into their enclosure so as to make up the second breeding population in Cornwall and they are now proud parents of two baby squirrels. They are located by the Walled Garden so there is easy access for visitors and also information boards to tell their story. Claridge’s, Fortnum & Mason and The Savoy Hotel all demand fresh tea leaves and where do they buy them from? Tregothnan Estate in Cornwall of course who also exports to Japan, India and China!! Originally Fortnum & Mason were the only stockist but from this year Waitrose is stocking this marvellous Cornish Tea in their supermarkets. Tregothnan is the only tea producing estate in the UK and here the tea grows all the year round, with the Cornish micro-climate that is cool and humid, it mimics the high foothills of the Himalayas. It is believed that The Tregothnan estate, with its perfect growing conditions, was the first place in Britain to grow Camellia sinensis outside about 200 years ago and is the only bush that produces tea, all other teas’ are tisanes (herbal tea) or herbal beverages. The Boscawen family who still live at Tregothnan were the first to bring the Camellia to Britain 200 years ago and the Manuka bushes were brought to the estate in 1888 by Canon Arthur Boscawen and are the UK’s only collection of Manuka plants. It is the Manuka bushes that now produce their anti-oxidant Manuka infusion and their prized Manuka Honey. For the greatest flavour the top ‘two leaves and a bud’ are plucked at dawn at least once a month during the season from April to October. The black and green teas, except the Single Estate, are blended with Assam, Darjeeling and China-type leaves to keep the consistency and the unique flavour. All the leaves are picked and processed by hand which gives it its unique smell and taste. In their Classic Tea there are five processing stages, plucking, withering which takes place on bamboo racks, rolling between two surfaces by hand, oxidation involves spreading the rolled leaves on a flat surface at a controlled temperature. Here the colour changes from green to brown and the last stage is to dry them to 2% moisture. From plucking to drinking it takes just 36 hours and all the processes are chemical free. In green tea steaming replaces oxidation that is why it retains its green colour. Tregothnan has produced their Classic Tea on the estate since the end of 2005 and this is the best-selling tea. Now their range consists of Classic, Earl Grey, Afternoon and Great British and one Green Tea. Added to this is the homegrown herbal infusions of Fennel, Nettle, Chamomile, Echinacea, Myrtle, Chocolate Mint, Eucalyptus, Lemon Verbena, Red berry, Peppermint, Pineapple Mint and of course their caffeine free Manuka infusion which is unique to Tregothnan. The Winter of 2013/2014 was the worst Cornwall had seen for many, many years with floods, gales and driving rain but the added moisture of the heavy rainfall and barely any frost provided the ideal conditions for the tea bushes – for them heavy rainfall is humidity. They love the wet weather so this years crop will exceed the 10,000 tonnes produced last year making 2014 a bumper year for Tregothnan Tea. 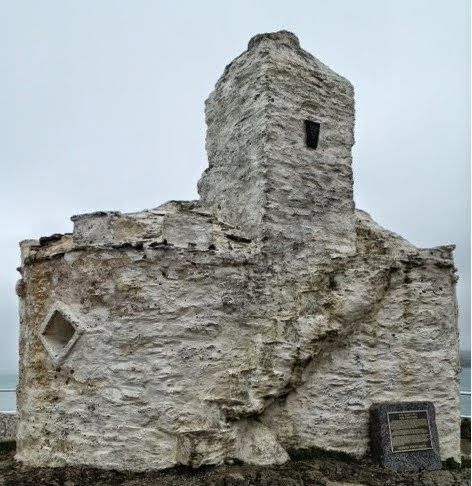 At the moment Crowdfunder and the residents of Newquay are all trying to raise £10,000 for the repair and upkeep of the Heur’s Hut which has fallen into disrepair because of its exposed position on Towan Head. Lord of the Manor Colonel Treffry owned the building - which dates back to the 14th century and from the 19th century as a Heur’s Hut - and in 1906 he leased it to Cornwall Council for 983 years at a charge of one shilling per year. At some time in the past Cornwall Council converted it into a public shelter by widening the doorway but now our Council cannot afford to spend the required amount of money to bring this Grade II listed building up to its original standard. They have spent some time making the hut safe but have put iron gates across the doorway so no-one can enter it in the interests of Health and Safety. The history of this building is unclear but in the 14th century was possibly used as a Hermitage and the Hermit directed shipping around Towan Head. From the mid 19th century the Heur occupied the hut and he would look out for the shoals of pilchards, sound the horn and bellow ‘Heva Heva’ which translates to ‘here they come’ to alert the fishermen in Newquay harbour. The fishermen would launch their seine boats and be guided by the Heur, with his two furse bushes, to encircle the shoal. Without this start Newquay may not have prospered and grown into what it is today. The Heur’s Hut needs specialist treatment for the repairs as only someone who has the qualifications in applying lime mortar can make the necessary repairs and continue with its upkeep in the years ahead. Until there is enough money the iconic Heur’s Hut, steeped in history and heritage, will have to stay in disrepair. Newquay Town Council is to take over the freehold of The Heur's Hut from Cornwall Council and they will refurbish it before the handover takes place. If a community interest company is set-up grants may be available but for now the money raised through Crowdfunder will go towards the ongoing maintenance. The refurbishment has all been completed and the Heur's Hut is once again looking spectacular on Towan Head.